I am a Project Scientist at the National Center for Atmospheric Research working in the Oceanographic Section of the Climate & Global Dynamics Laboratory. I am part of the team that is coupling MOM6, an "open development" ocean model primarily maintained by scientists at the Geophysical Fluid Dynamics Laboratory , to the Community Earth System Model (CESM). Once this is accomplished, I will serve as the science liaison for the Ocean Model Working Group of CESM. 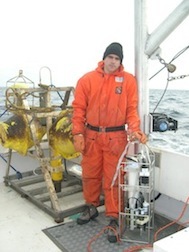 My research is focused on understanding physical processes controlling the ocean circulation around Antarctica. I am particularly interested in the role that these processes play in regulating the melting of ice shelves and the formation and export of bottom water. I approach these problems by relying on idealized and realistic numerical model simulations that are constrained by observations and theory.